Cleaning fee waived on a 2-night stay($50-75 value) for either of our two cabins located directly on the Wind River with an in-town location! Walk to restaurants, shops and museums. Lots of off-street parking for snowmobile trailers. Two cabins available to rent individually or both together for a group of up to twelve people. A large yard sits directly on the Wind River with a BBQ grill, campfire pit, and outside eating areas. Bicycles to cruise the town are available to our guests at no charge. “Lil’ Cabin On The Wind” is a recently renovated one-bedroom 800 sq.ft. 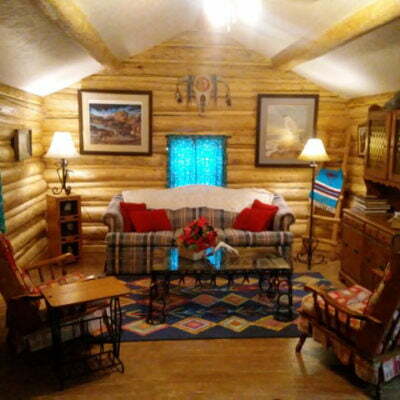 fully furnished traditional log cabin that can sleep up to four people. NOTE: You can also rent the “Cabin On The Wind” for combined sleeping for up to twelve guests. $50-75 off (Note: cleaning fee waived ONLY if booked direct through our website).